It's been a busy weekend for ATLAS. Last night, well, actually early this morning, we received the "stable beam" flag from the LHC. What this means is that when the LHC has sufficient control over the beam, they send us the flag to tell us that it is safe to switch on the more sensitive detectors. For ATLAS, these are the silicon detectors, which provide a very precise measurement of the trajectories of charged particles. As they are located very close to where the protons collide they needed to be protected in case particles accompanying the beam could deposit large amounts of charge in the silicon, which could present a danger to the read-out electronics. The simplest way to protect them, is to have them switched off until the stable beam flag has been received. We were initially told to expect the stable beam flag mid-afternoon yesterday and so, even though it was a Saturday, as the afternoon wore on more and more people started appearing in the control room. However, it's actually very difficult to give an accurate time estimate of when one expects to get a new piece of equipment to do something never done before, so each hour, we'd hear that we were expecting the flag in a few hours. Of course, we weren't just sitting around waiting for the beam, but rather checking things and preparing for what we'd do once it arrived. I gave up around 4 am and went home to sleep, but most people were there until 6:30 am, when it was announced that there wouldn't be a stable beam flag until the afternoon. However, the LHC operators decided to try once last thing, and suddenly the experiment received the stable beam flag just after 7 am. Many phones starting ringing and everyone arrived back in the control very excited but having had very little sleep if any. 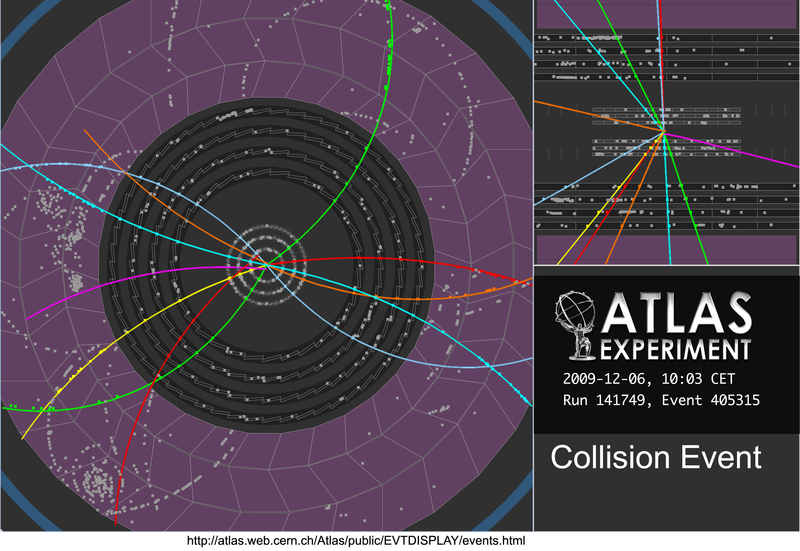 Shortly afterwards we saw the first collision event with the silicon detectors. It was a really exciting moment seeing the detector record data from the LHC for the first time! The difference to the old event displays are the tiny little dots near the centre of the detector. Those are where the particles deposited energy in the silicon detectors. The advantage of the silicon detectors is that they measure the position to an accuracy smaller than a human hair! We kept recording for a few more hours until we'd recorded almost 10000 events in total. Next we need to use this data to start understanding the detectors so that we are ready to make physics measurements. Oh, and try to sleep a little.